Help! is finally seeing the light of day again on DVD October 30, The Beatles just announced today. The story follows The Beatles as they become passive recipients of an outside plot that revolves around Ringo's possession of a sacrificial ring, which he cannot remove from his finger. 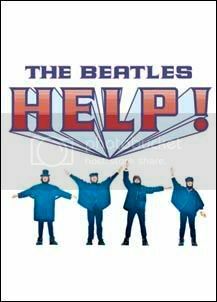 *The Beatles in Help! – 30 minute documentary about the making of the film with Richard Lester, the cast and crew. Includes exclusive behind the scenes footage of The Beatles on set. *The Restoration of Help! – An in depth look at the restoration process. *Theatrical Trailers – 2 US trailers and 1 Spanish trailer. *1965 US Radio Spots - Hidden in disc menus. *There will be 2 editions of the DVD - a standard digipack and a deluxe boxed set that will contain a reproduction of Richard Lester's original annotated script, 8 lobby cards and a poster, plus a 60-page book with rarely seen photographs and production notes from the movie. Both the deluxe book and the standard booklet feature an introduction by Richard Lester and an appreciation by Martin Scorsese. Very, very nice. Watch a trailer for the release here. Any other announcements today tomorrow?